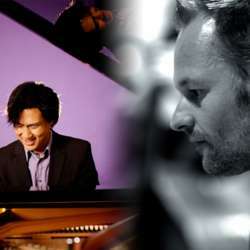 The British-Korean pianist Hyung-ki Joo, along with Aleksey Igudesman, is a regular guest of major concert halls worldwide. His recording of piano works Billy Joel's Fantasies & Dellusions was 18 weeks # 1 on the Billboard album charts in the US. Together with Flip Philipp and his band consisting of members of the Vienna Symphony Orchestra, he will perform music by George Gershwin Maurice Ravel, Leonard Bernstein, Igor Stravinsky and others in their own arrangements or versions for jazz ensembles.